Before releasing the final set in the Arabella Bullion collection for 12″ x 8″ I would like to take you through a stitch out of one of the panels, GFE-ARB-5-14, to explain what I did and why, as well as the observations I made and the lessons I made from the mistakes that occurred. 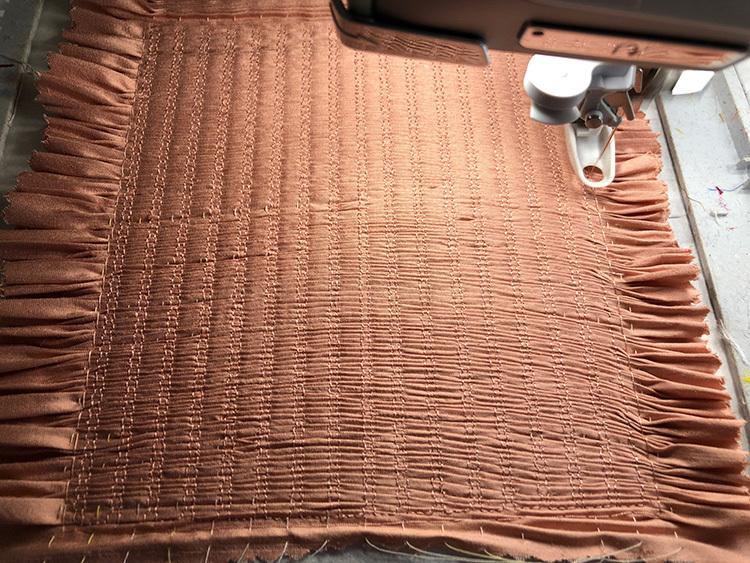 This panel is a horizontal panel which holds vertical pleats so it could be used on the yoke of a baby’s dress. I wanted to see if it was easy to crop these panels as not everybody will prefer such large panels and they may not have the hoop to accommodate them or require a smaller version for the project they have in mind. 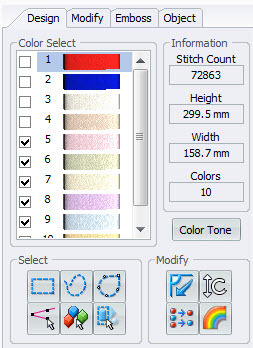 I opened the design in my software and eliminated the first four colours which form the background for more accurate deletion of the parts of the panel. When this was done only the roses and leaves were visible as shown below. 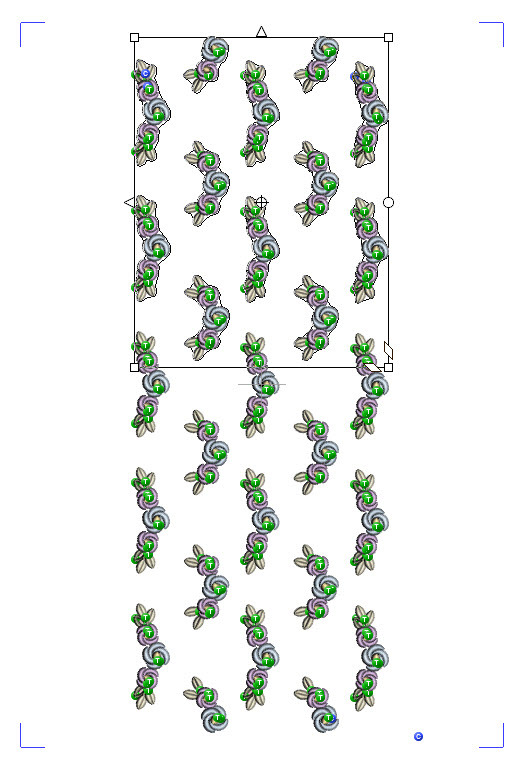 I selected the roses and leaves I wanted to remove with my lasso tool, which forms a box around them allowing me to deleted them. Next I made all the colour ways visible and selected the embroidery and holding stitches above the roses and leaves, with a box. This selection was also deleted. Now you can see that the design in question is not central in the hoop, so I moved it to the centre. Although the Outline alignment stitches (OAS in red and blue) which show you the size and shape of the design have been cropped at the top, they are still usable. I saved the design under a new name so they original file was kept safe and sent it to my embroidery machine. 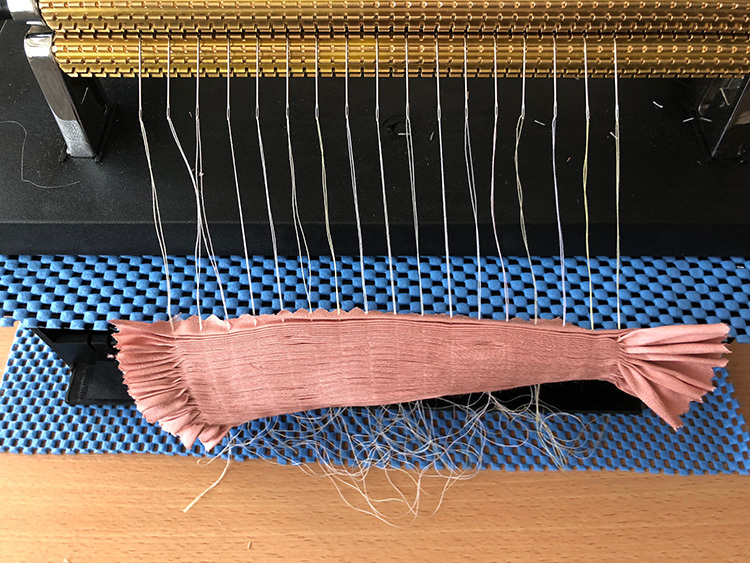 Next I prepared my pleater by threading all the needles making sure I had enough threaded for the fabric I would be embroidering the design on. 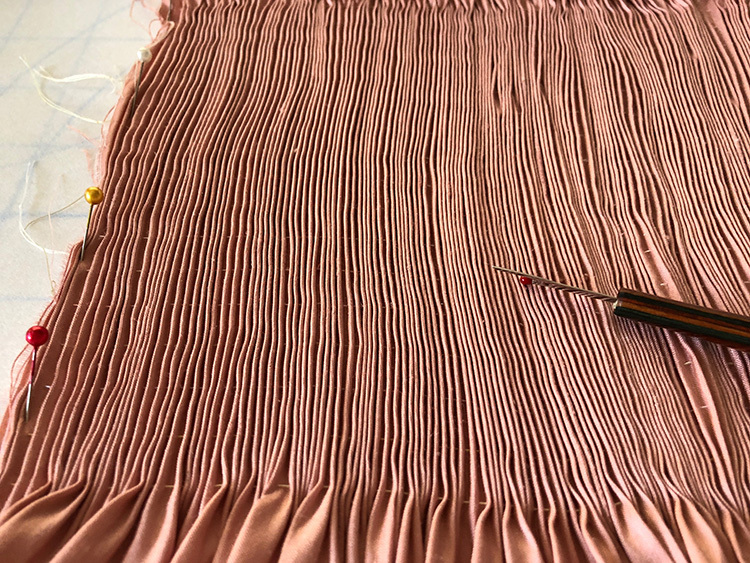 I tend to pleat about four to five times the length of fabric, making sure that there is an inch or so each side too. 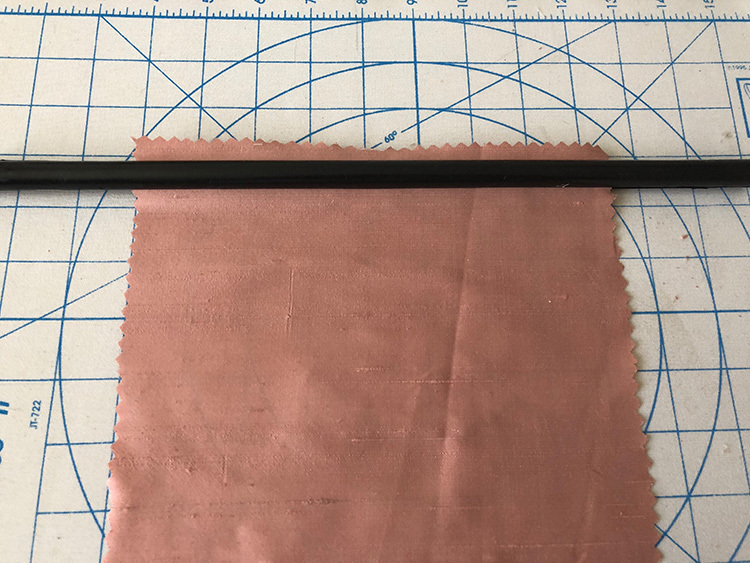 I use my June Tailor ironing board to roll the fabric on to my magnetic roller, using the squares to position both the fabric and the rod to prevent uneven rolling. I am discovering how to pleat several lengths of fabric one after another without having to re-thread all the needles. 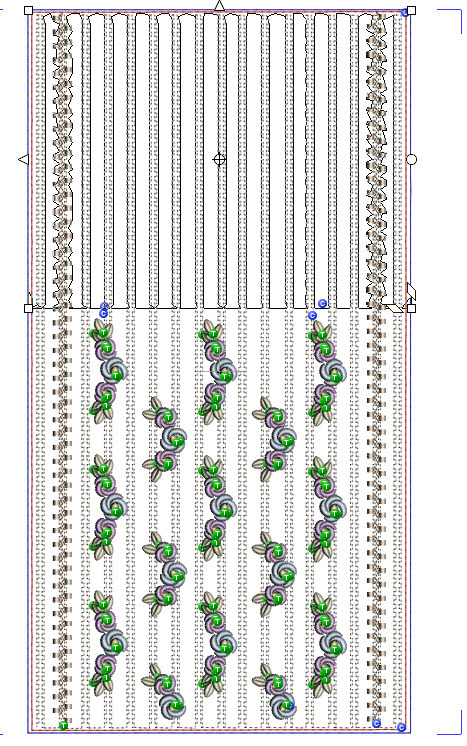 It seems that tying the ends together prevents this from happening and should only be done for individual panels. I managed to trim away the knots I made and move the panel through the threads to release it. 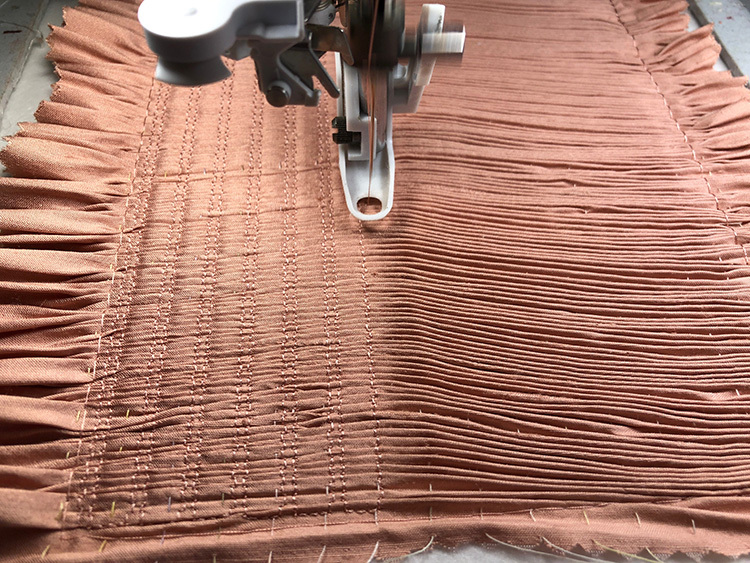 It is weird how the pleater works, the opposite to how you would expect so I encourage you to test out lots of practise panels with old remnants rather than on precious fabric. My first attempt at pleating silk was not that successful first time around, as it was a very slubby silk and I needed more practise to get it right. This time around I choose a smooth silk and found it easier. The hardest part is feeding the fabric evenly in from the back. Keep trying until it feeds in evenly otherwise your pleating will slowly move off centre. My one reservation about the thread dispenser is that it is lighter than the pleater so the combination is top heavy. Ideally the dispenser should be made of wood so it doesn’t move but I shall experiment with adding something inside to weigh it down. 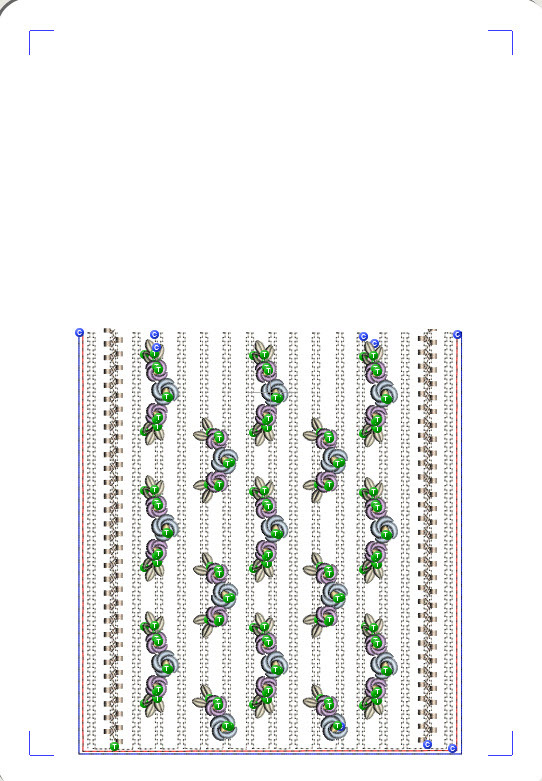 Even the use of non slip matting does not prevent the whole thing moving about. At one point the pleater moved as I was removing my fabric, tipped over and one of the needles went into my finger so be careful as they are sharp and the pleater is heavy. Not to worry I did not bleed all over my peach silk dupion! This was when I lost the end of one of the threads somehow and had to remove it completely, but I proceeded to see what difference it made to the finished panel. I used one layer of stitch and tear in my hoop to see what difference that made, rather then using the more expensive Sticky Plus. A generous spray of temporary adhesive was used to hold my pleated fabric in place. I pinned one end though the stabiliser into my June Tailor padded board aligning it along carefully. (Do remember to remove the pins) I did not have a suitable comb to “dress” the pleats but found one of my larger stitch rippers works just as well, using the bead to smooth everything evenly rather than the point. Take your time over this important process and try to make sure that all the gathering threads disappear into the folds. 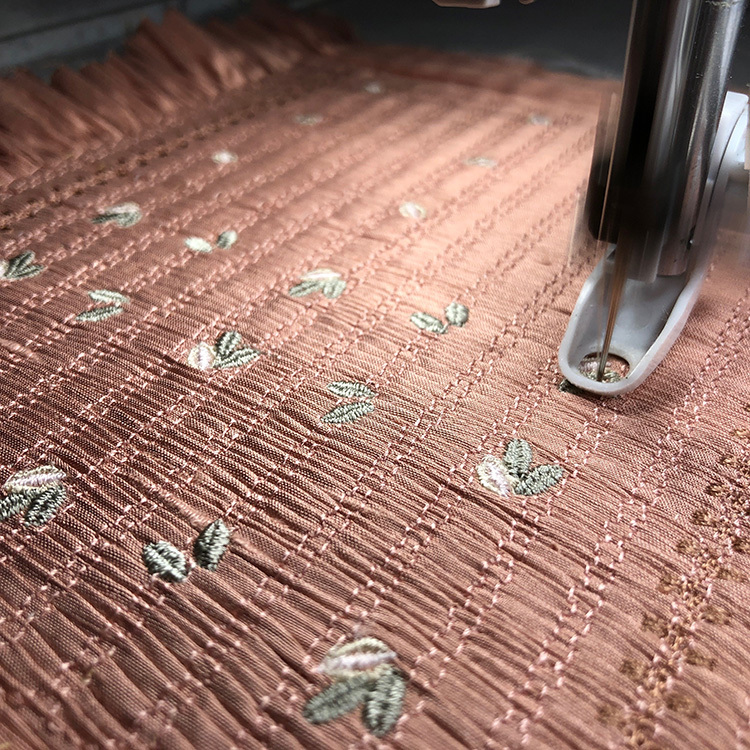 If they are visible the pleats are not close enough as your embroidery will also push them apart slightly in places. I had some annoying areas which refused to lay properly but pulling each side at the same time will help the pleats lay straight too. 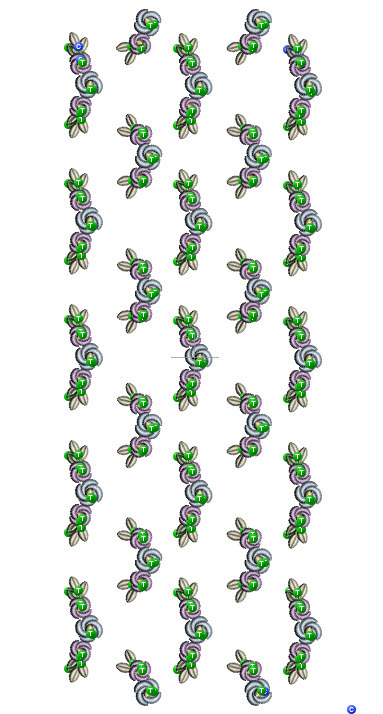 I changed some of the thread colours for this design especially the first two colours as white not be appropriate. You can see that there was some distortion as I feel the temporary adhesive on the stitch and tear is not quite so adequate for the purpose. Strangely enough the opening out did not happen where I had pulled out a thread by mistake. That error did not effect the panel at all. I think the opening up of the pleats happened where the fabric was not being held sufficiently by the adhesive spray. I choose a my favourite green, Sulky Rayon 1229, Light putty for the leaves as I knew the peach fabric needed a slightly darker shade of green. 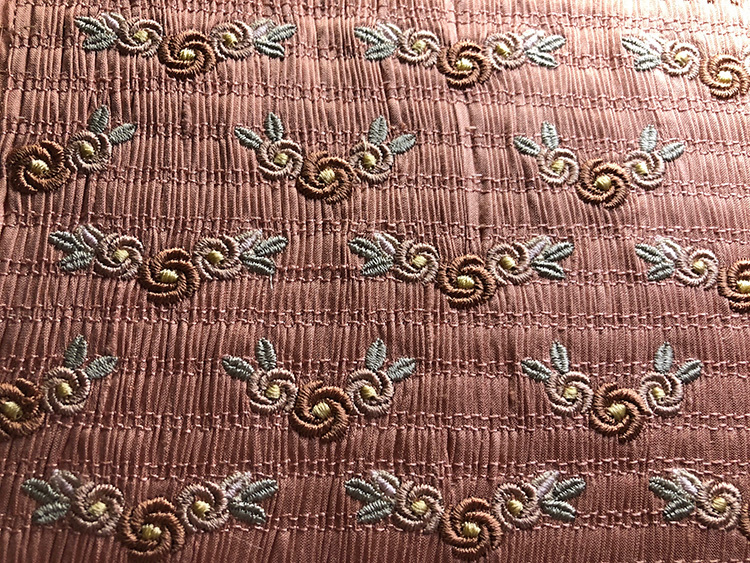 For the embroidery holding stitches and the large roses I swapped to Sulky Rayon 1837, Light cocoa and 1820, Creamy peach for the smaller roses. I love the results. The finished panel is fine and I think it will be inserted into a little case for holding sewing items as I have a few remnants left. 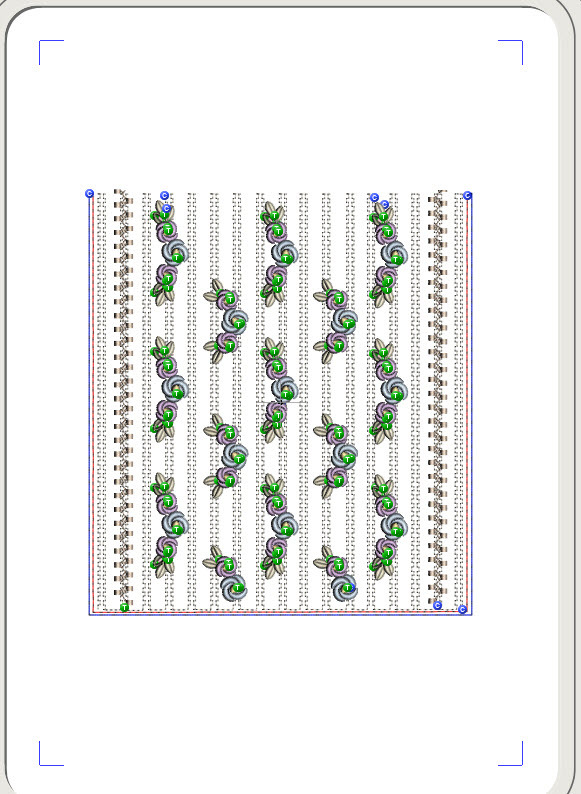 To begin with this final set of Arabella bullion designs for 12″ x 8″ hoops had 8 smocking panels, but I digitised another two to give more choices and variety. Check out my video on YouTube to see all the designs. Enjoy these beautiful design and if you invest in a pleater you will have so much fun. I just love embroidering out smocking designs and will be creating more in the future. Do let me know your thoughts and ideas on how to use these designs. I particularly would love to see photos of your customised panels. 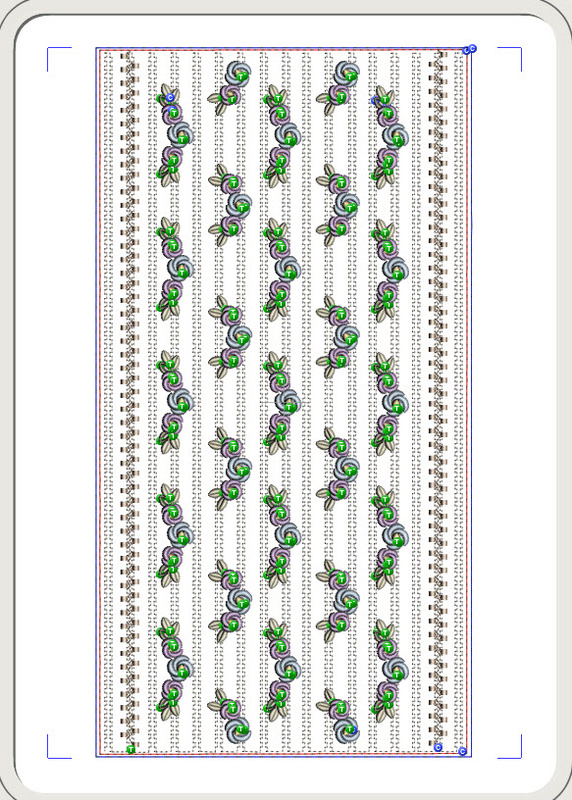 This entry was posted in Discussing machine embroidery, New Designs and tagged colour changes, embroidery on silk, heirloom embroidery, machine embroidery, Outline alignment stitches, Smocking designs. Bookmark the permalink. Hi Hazel, Would it be possible to attach your thread dispenser to a piece of wood so that the thread dispenser would be heavier? Or perhaps you could use a layer of drapery weights or something similar to give weight to your thread dispenser. I know I saved the weights from my patio vertical cloth blinds to use as fabric weights before I threw the blinds away.. They are flat about 1/4 th inch thick and 21/2 x 2 inches and are made out of metal. Anyway, They make Great fabric weights. Love your tutorial and all of your hints and tips on what worked for you and what to watch out for when making the smocked panels. The technique on how to delete parts of a design to fit a smaller hoop I found to be very useful. Hazel, I have a wooden “box” that holds my spools of thread, like a ribbon dispenser. 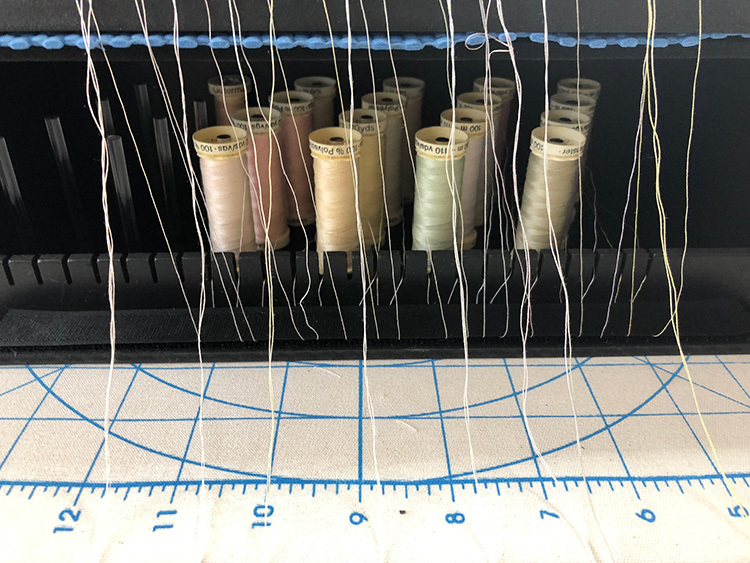 There are three small diameter dowels that hold the spools of thread horizontally so the thread is allowed to roll off the spools. This allows me to have individual spools of thread for all 24 needles of my pleater. The top to this “box” is removable and held in place with hook and loop tape. My pleater sits on top of the “box” allowing for easier threading of the pleater needles and is quite stable. Did you buy it or was it made for you?